There is only one high wheel bike race in the U.S.A. and it takes place in Fredrick, Maryland. This past weekend I attended the 2016 National Clustered Spires High Wheel Race where participants ride bikes also known as penny-farthings – both antique and modern versions. Just for you, I took video. Despite the oppressive heat (95+) and humidity, they raced. Some wore period clothing (think wool knickers). Some were there for the fun of it and some were out for gold. Three competitors traveled all the way from England – with their bikes! – to participate. 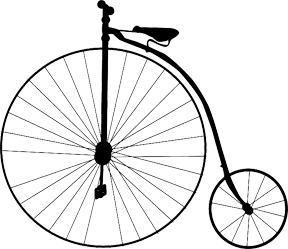 As you watch, keep in mind that while the modern-made version of the penny-farthings can be purchased with brakes, the originals could not. They also had solid rubber tires for a rather rough ride. And, should you hit a rock or a rut or brake overly hard, chances are good you were going to fly forward over the handlebars in what is known as taking a ‘header’. As to getting on and off? There was a lot of hopping and jumping. But the riders were all experienced, and I witnessed no disasters. “Get a bicycle. You will not regret it, if you live.” ~ Mark Twain, after learning to ride the high-wheeled bike. And here’s a view of them coming around on lap one!